Summer has always been my fourth favorite season but somehow this particular August has caught me in it’s languid little trap. I realized it finally when I touched the watermelon on my kitchen island with the blade of my sharpest knife. 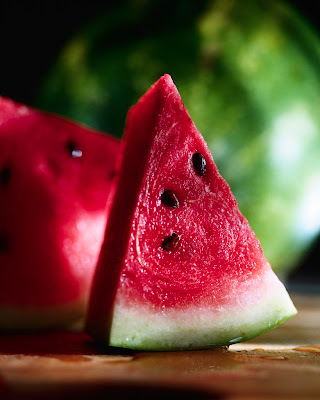 The cracking sound of a ripe and ready to burst melon echoed through the empty room and the smell of it told me everything I needed to know about the taste. The only thing that kept me from cutting off an enormous chunk and heading out to the deck to eat it, juice washing down my face and hands, was the little black dress and high heels I had put on to go shopping later. Perhaps that’s what has got me about summer this year. I suddenly notice that I have had no time to lie back in it’s embrace and enjoy. Dad listened to the back and forth typical of the close rural community, trying to look nonchalant. The truth of what he had tripped over began to dawn on him. It was Mr. Johnson himself hunkered in the ditch watching over his precious crop, shotgun loaded with birdshot. He never got off a single round in the darkness such was the speed and stealth of the accomplished young melon rustler. The mischief in my dad’s blue eyes had not diminished in the 30 intervening years. The story he told was as fresh as white sheet flapping on an old fashion clothesline on a hot August day. I remember how hard he worked, more than any man I ever knew, but he knew how to sit it down when work was done. Today he would be pleased with me. I’m going to take a lesson from him and sit for a hour in the cool shade, while the watermelon days last.